With this last part, the Show-InputForm() function is completed and we can move with providing examples. 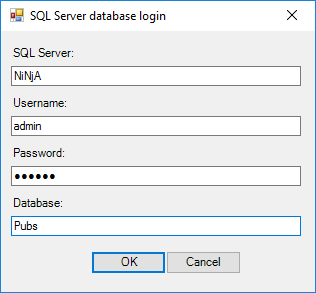 login = Show-InputForm "SQL Server database login" "SQL Server" "Username" "Password*" "Database"
$ConnectionString = "Server = $server; Database = $database; Integrated Security = False; User ID = $user; Password = $password;"
You can download the complete PowerShell script from here. Nemanja is an IT enthusiast who enjoys reading books, playing and watching soccer and basketball, and traveling. He uses his spare time on tuning and styling of his car, playing video games, and fishing. Nemanja is currently working for ApexSQL LLC as a Software sales engineer. He’s specialized in SQL database schema and data comparison and synchronization, and he helps customers with technical issues, providing DEMO presentations, and does the quality assurance for ApexSQL Data Diff and ApexSQL Diff.